The session addressed two main topics in the scope of mainstreaming climate change into education system. The first topic was the development of Terrestrial Carbon Accounting (TCA) which became the main focus of the first three presenters, including John-O Niles (Carbon Institute), Prof. Gao Jinping (FCAMC SFA, China) and Prof. Rizaldi Boer (CCROM SEAP). The second topic was the development of UI GreenMetric World University Ranking (WUR) which was delivered by Prof. Riri Fitri Sari. Terrestrial Carbon Accounting (TCA) is a German government supported academic partnership program for Indonesia, China and America that aims to enhance capacities of countries to implement better transparency in the MRV framework, especially in land use and forestry sector. 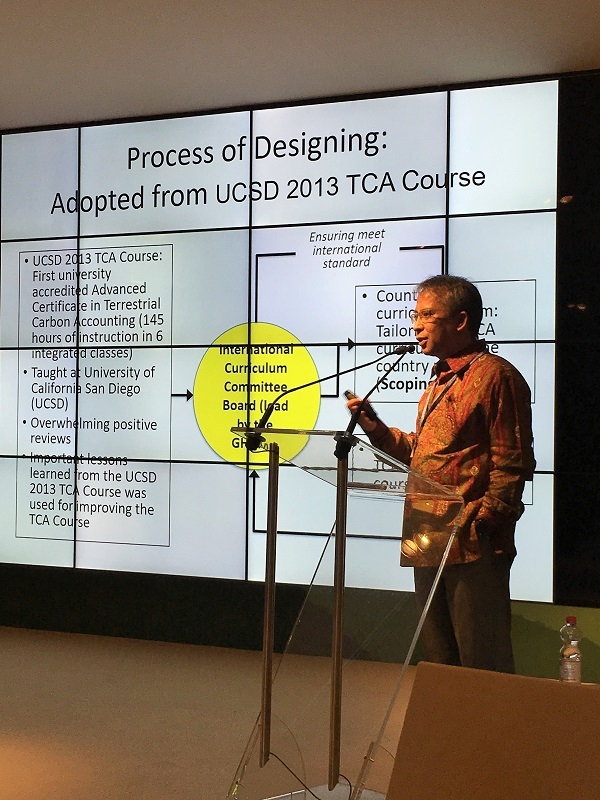 TCA was built as a comprehensive academic program that comprises a variety of technical skills, such as forestry field methods, advanced statistical analysis, and remote sensing. One of the purposes of this program is to lower the level of uncertainty in carbon estimation and inventory from land use sector over time by having professionals working on the carbon accounting to help with both scientific and policy reason. A few questions arose during the session, particularly related on the possibilities to build a partnership for TCA program with universities outside Indonesia and China and scholarship opportunity to join the program. These questions were expressed by participants from Nigeria and Fiji. As a response, the Mr. Niles confirmed that GHGMI is actually now actively exploring on the possibilities to develop TCA programs with different countries and different universities with a good reputation in the land-based science. Scholarship is also available with two kind of schemes: part and full scholarship. In addition to this, Mr. Boer once again emphasized the obligation of local government to report to national government on the carbon emission and sequestration statuses from the land use sector, therefore training for local government staff could be an opportunity for them to join this program.